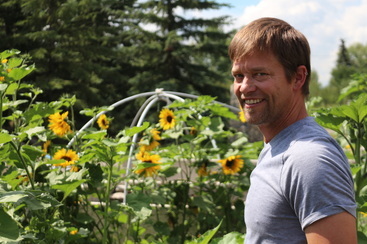 Rod is one of the original Urban Farmers in Calgary and is a founding member of YYC Growers- some refer to him as 'the Rodfather'. Rod most comes alive when he talks about the soil, and its potential as a compelling, living system to take us confidently into the future. As a regenerative farmer, Rod is excited about the promise these practices have for increasing water-holding capacity, reversing climate change, increasing biodiversity, and increasing the nutrient density of our food. Rod is always ready for meaningful conversation, for connecting people with their highest potential despite any ecological grief they may be encountering. When he's not farming, Rod loves to hang out with his adult children or sing professionally with Luminous Voices, and he is a budding carver. We are always open to anybody who would like to come spend a day working in the gardens, processing vegetables, and learning our day-to-day operations.